Over 60 people attended the AONB Forum on 22 February to hear more about trends in farming and tourism that will affect the area. The Forum was also a chance to celebrate the voluntary contribution of seven individuals who have made a real difference to the area and a new Award given to the AONB. Thought provoking presentations were made by Professor Michael Winter from the Centre for Rural Policy Research at the University of Exeter and Nick White, Chairman of the North Devon Marketing Bureau. Both farming and tourism have considerable influence on the AONB’s landscape and are an essential part of the rural economy that keeps the North Devon coast as a living and working landscape. The talks provided a detailed context to what is happening in the two sectors and the likely impact of changes related to Brexit and changing behaviours, which could affect the AONB landscape. Professor Winter raised concerns about the future of smaller livestock farms if there are significant reductions in support payments to farmers, whilst welcoming the focus on payment for public goods from the environment and the government’s ambitions in the 25 Year Environment Plan. Nick White explained the gradual changes in visitor expectations both for higher quality accommodation than their home environment and for ‘experiences’. This is reflected in the shift from camping fields to glamping and lodges, and the demand for organised experiences whether water sports, themed trails or locally distinctive food and drink. Nick White, on behalf of the South West Tourism Alliance, presented AONB Chairman Steve Mulberry with the Excellence Award for "Outstanding Contribution to Tourism". This award was given to 18 protected landscapes across the South West, including the five Devon AONBs, the two National Parks, the North Devon Biosphere Reserve and the South West Coast Path. 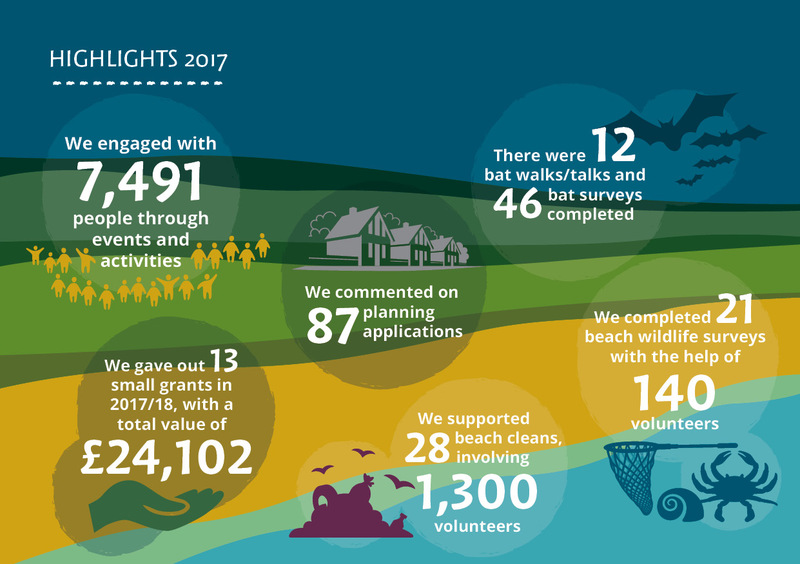 AONB Manager Jenny Carey-Wood presented highlights from 2017 describing the work being done across the AONB as published in the AONB Review 2017. This included the impressive beach cleaning and citizen science work supported by the Coastal Creatures project, with funding from the Heritage Lottery Fund and Tesco Bags of Help. Engagement with schools, Petroc College, community groups and adult volunteers increased considerably over the year through the work of AONB staff Cat Oliver and Dave Edgcombe. Community engagement work and wildlife surveys were also being delivered through the Devon Greater Horseshoe Bat project, focussed on Braunton and Combe Martin. Looking forward, Jenny reported on bids to support work on coastal heritage, the forthcoming community consultations on the five yearly Review of the AONB Management Plan and an invitation for new members to join the AONB Partnership. The evening was rounded off with a Celebration of Volunteers who have done an enormous amount to benefit the AONB over the last year in particular areas of work. Awards went to John Breeds (beach cleans and bats), Paula Ferris (Coastal Creatures project support), Mark Fellows (beach cleaning on the Hartland Peninsula), Nicola Mello and family (supporting Bioblitzes), Jan Whittington (citizen science), Jack Wiggins (student volunteer) and Richard Dyer (farming and wildlife). Thanks were expressed to the speakers and the Pier House at Westward Ho! who generously hosted the event in their beautifully re-decorated Bay Suite.